Search is all about content discovery. The increasing novelty of searching by voice has obvious ramifications for the search industry; namely “How will voice search change SEO?”. Long-Tail keywords can now be captured more effectively using the “who, what, where, why and how to” natural voice searches. This means targeting longer search query phrases that are conversational in nature yet still popular. Identifying what questions your customers are asking Google and answering them in your web pages is a viable keyword and content strategy to adopt. If you don’t know about “Ok Google” I’d suggest reading “Ok Google” Voice Search & Actions and ensuring you have it turned on so the below examples will work. You can optimize for a range of voice search capabilities but I’ll stick with an easy one called Facts & Quick answers. First, you have to get your content featured in Google’s Quick Answer box (see Optimizing for the Google Answers Box). Voice Search Query 1 – When is SMX Sydney? Takeaway – ensure you end your page TITLE TAG with a pronounceable domain name or preferred “source” phrase because this is what Google reads out. PROTIP – your CMS system can be customised easily for this and if your using a basic WordPress instal check your site title: WordPress > settings > general > site title . Voice Search Query 2 – How to cook zucchini flowers? Takeaway – ensure you answer the question in one complete sentence. Google appears to ignore bracketed words and excessive punctuation. 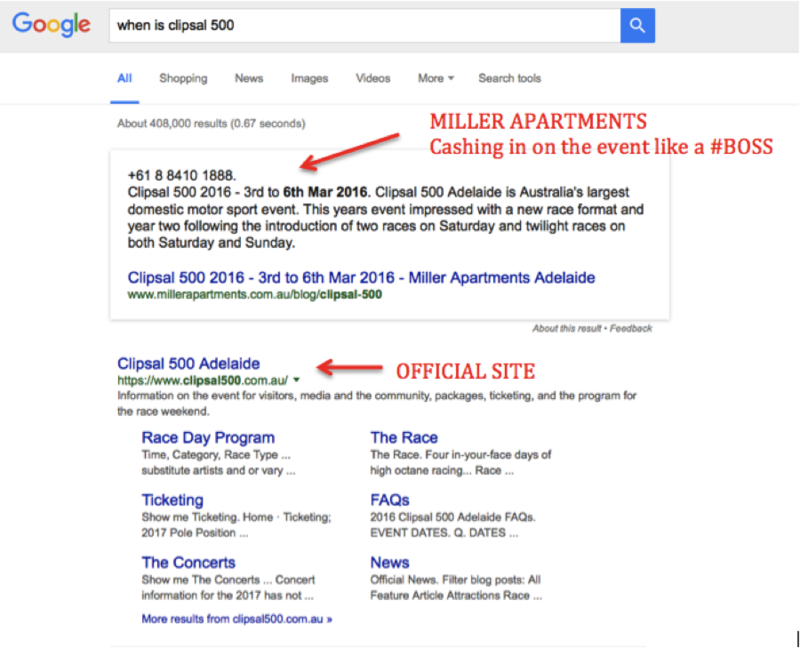 Voice Search Query 3 – When is Clipsal 500? Takeaway – if your product or services are relevant by way of proximity / seasonality then consider optimizing your web page content for these target annual events. NOTE – I’m in no way affiliated with Miller Apartments and have never used them as an accommodation venue. I have been to the Clipsal 500 and can recommend you visit Adelaide!